They just don't make them like they used to! Even my shop phone is circa 1940! I'm firmly of the opinion that any product will last as long as it already has. So a unit made 50 years ago will last another 50 years. Excellent thread. Well done. I wish I had kept my SP-600. I'm in the process of recapping the RF section. Today is the third day I've been working on it and it's a chore! 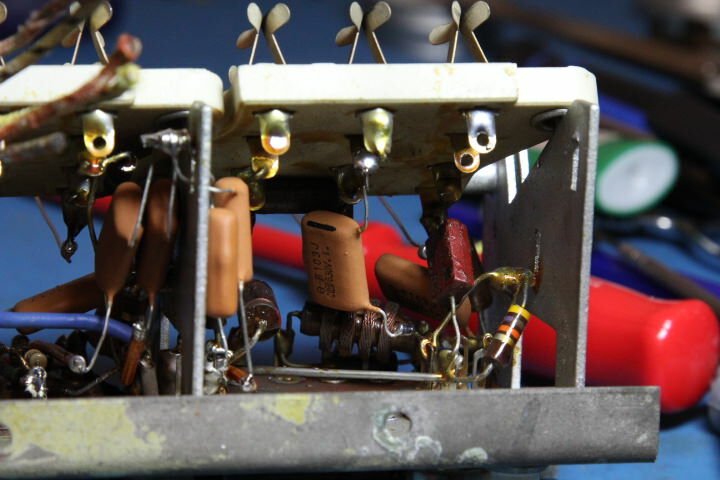 I am now on the oscillator section and I have a question regarding capacitors. 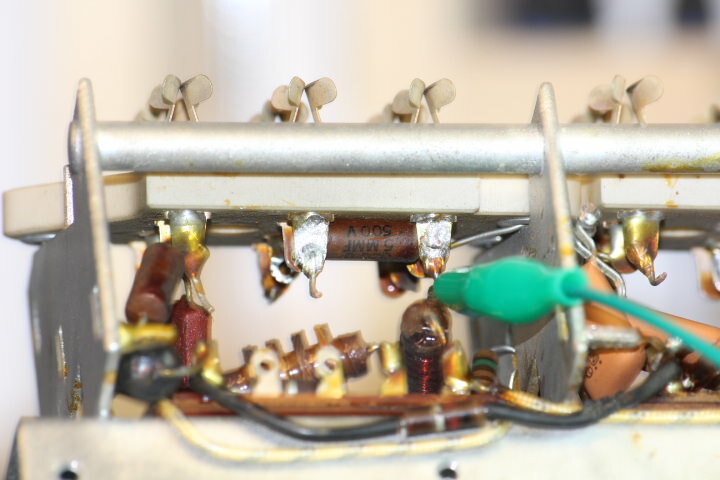 The radio has quite a few of these small, tubular, brown capacitors. There are two in the oscillator section, C79 and C80. Both are marked 5mmf 500volt, ERIE Ceramicon. I'm going to assume from the name that they are ceramic capacitors? I've never seen them before that I can remember. mmf=uuf and uuf=pf yet these capacitors measure at 23pf for C79 and 102 for C80. This is in circuit mind you. I'm sure there are people out there who have experience with these caps. Are they good, are they bad, are they ugly perhaps? Should I replace them? I really don't know what to do with them at this point. Here's a crappy pic. The caps are the one at the top and the one to the left. Both are marked 5mmf 500volt, ERIE Ceramicon. I'm going to assume from the name that they are ceramic capacitors? 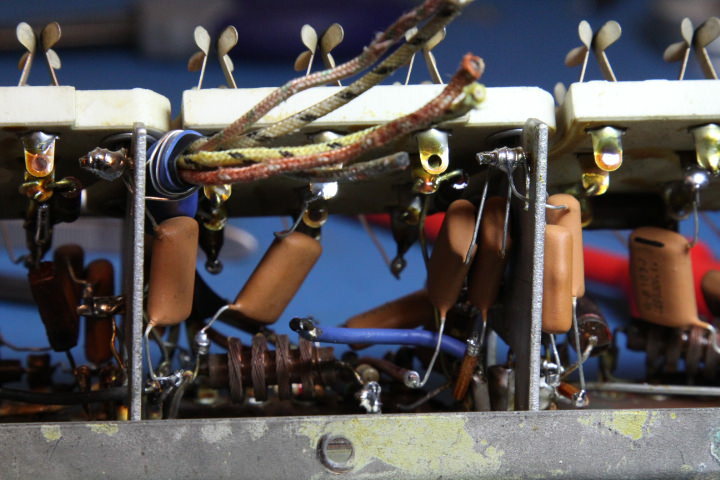 Erie Ceramicons are perhaps the highest-quality electronic parts ever made. 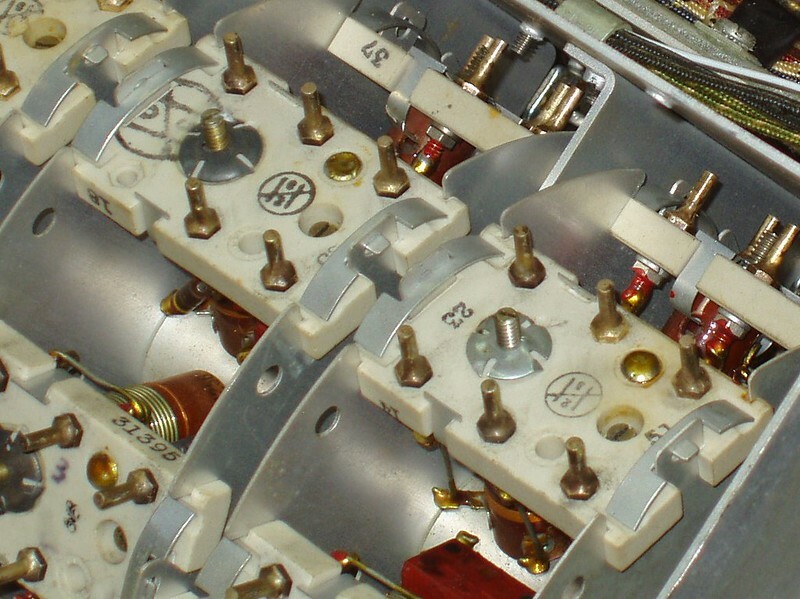 The only bad ones I've encountered in 65+ years of repairing radios have been physically broken. My macro lens has a minimum focus distance of 1 meter. It's difficult to work with. Are you implying that I should disregard the readings according to your experience? I defer to you, Leigh. I now see where I went wrong. I agree with Leigh, only the physically broken ones are bad, never have seen a bad one that was in one piece. Yeah, there were two things I overlooked when testing these caps. 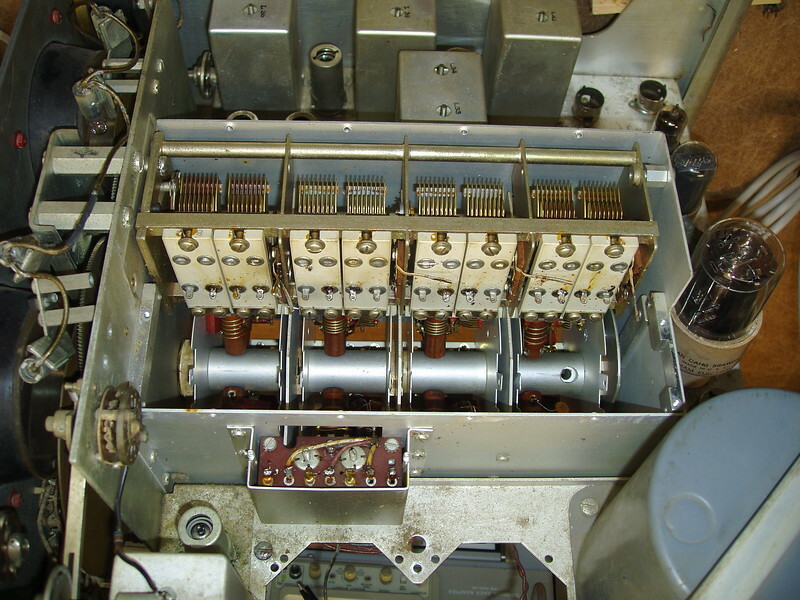 C80 has one side connected to ground and the other side connected to a terminal shared with a 100pf capacitor in series with a 47k resistor to ground. The tester was measuring both capacitors in parallel and ignoring the 47k of resistance between them. I was rather surprised at that. I figured that 47K was a pretty high resistance for the meter to just ignore it. C79 is connected to ground on one side and I realized after testing it a few times that since the ground of the RF section is a rather large piece of metal, it was likely giving me the false reading. I got a much more accurate reading when zeroing the meter after connecting the ground side lead. Both caps are indeed around 5pf. Which is good since I don't have any replacements rater for 500 volts! I doubt that voltage rating is terribly necessary, but still. I've never encountered any vintage ceramic caps rated less than 500 volts. 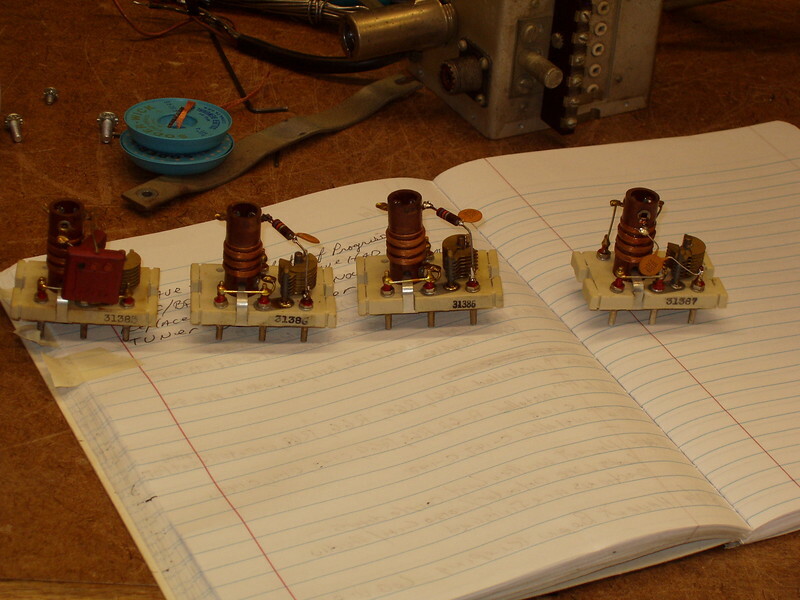 Obviously those can be used in circuits requiring lower voltage. There are modern disc and MLCC ceramics rated as low as 50 volts. Measuring the value of caps below 10pfd requires good equipment and good technique. There are dozens of sources of error. For example, you have capacitance between the leads of the meter, between each lead and the environment, and from your body to the test system. And the bench on which you're running the test cannot be metal or have significant metal supports. One primary point is that they cannot be measured in-circuit. If they cannot be completely removed for test, at least one lead MUST be disconnected, preferably the ground lead. Motorola used to use ceramic caps of similar style with values less than 1pfd and tolerance of +/- 5%. We bought them from Erie IIRC, and always found them to be dead on value. But we had to check each batch that came in, just like any other incoming part. They sent these caps to the engineering department because the regular parts folks could not measure them, so I got to check them. Yeah, I figure that the only reason they're rated for 500 volts is because that was what they had on hand. 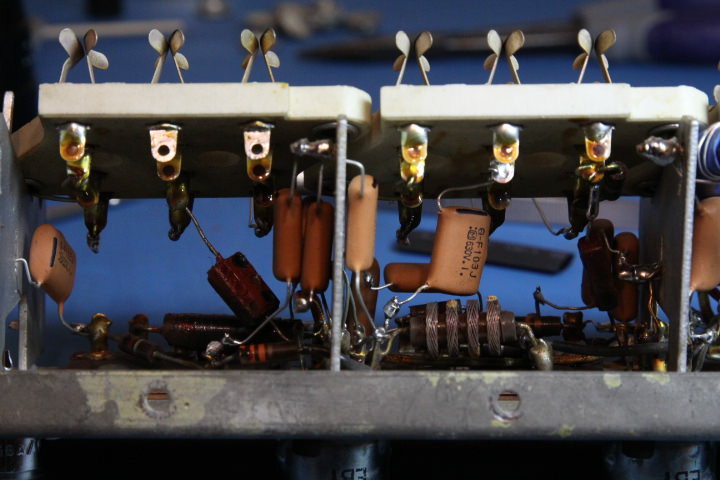 Back in 1952, I can't imagine there were too many low voltage capacitors being manufactured. I have a limited supply of NOS ceramic and mica caps rated at a few hundred volts and a lot of modern ceramic disk and MLC caps rated at 50 volts. 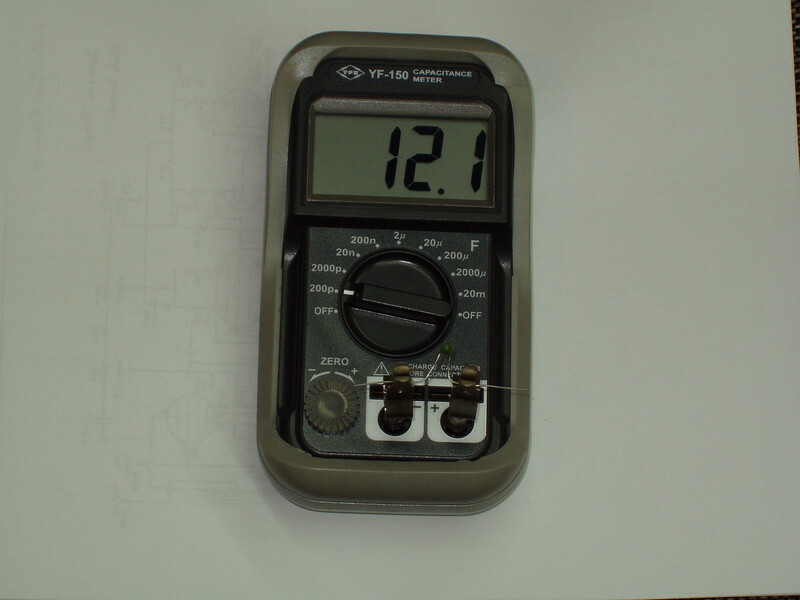 I have three meters that measure capacitance. One of them has trouble with anything under about 25pf, one of them is a modern multi meter that is as good as useless, and my trusty one is an old JDR Instruments multi meter that can measure down to one pf rather accurately. It uses a socket to plug capacitors into, but since it has a zero knob on the front, I can use clip leads and zero it out to measure larger capacitors, trimmers, and variable capacitors. I always try to keep the leads spaced far away from each other to avoid parasitic capacitance and if there is a large ground plane, I attach it first then zero the meter. In this case, I hadn't noticed that one side was grounded and I had been attaching the other lead first, hence I was lead to believe that all the capacitance reading I was getting was from the capacitor being tested. All the other capacitors I had been testing are essentially isolated from the circuit when the band sections and tubes are not in place, so they tested accurately even in circuit. Modern hand held type meters that will measure less than 10pF, with any accuracy, are few and far between. As you are finding out, even in the HF region these values of capacitance are not uncommon. I have one hand held and two bench top, cap meters capable of accurately measuring into the single digit pF range. A Tektronix LC130, a Boonton 250 Rx meter, and, to me a brand "X" hand held. 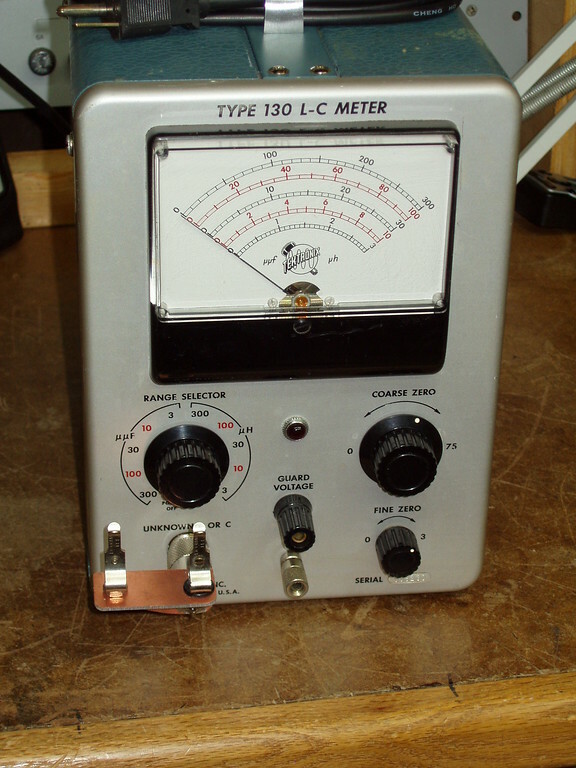 The Tek 130 has been around since at least the early sixties, can easily measure down into the single digit region of both caps and inductors, and is a very easy to use L-C meter. 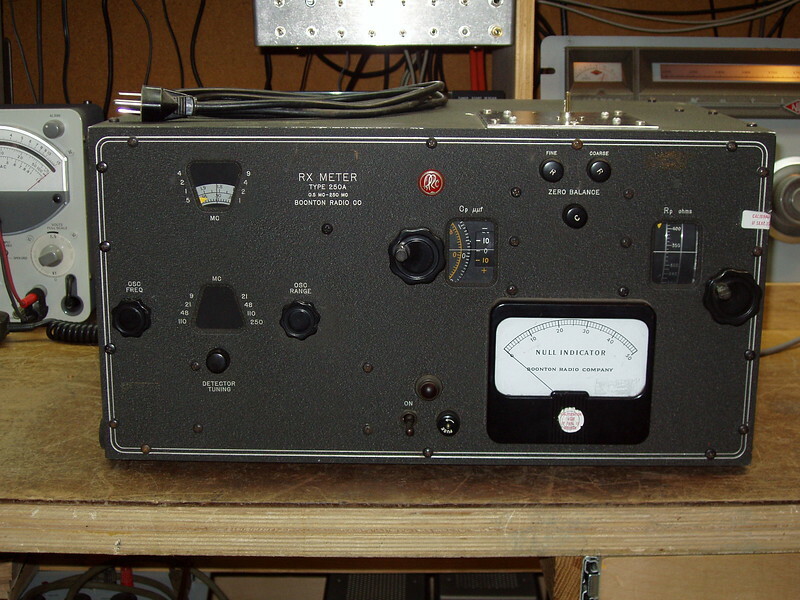 Older yet, is this Boonton Rx meter, which can easily measure well below 1pF and 1uH. Not as convenient as the Tek 130, but quite accurate, and not a difficult process. Last is this no-name little handheld unit. I've been very impressed with this meter. It's very stable when balanced at "0" and reading small values, it presents equally stable readings. These three meters don't offer up exactly the same value when measuring the same 1.5pF cap, but they're certainly close enough. Last edited by Mikeinkcmo on Jan Sun 28, 2018 12:28 pm, edited 1 time in total. Very nice looking units, Mike! I always prefer older gear. Modern stuff just doesn't have enough dials and knobs. The RF section is done!!! I've replaced all 20 black beauty capacitors and one ceramic disk who's lead broke off as well as two burned resistors. R15 is a 510 ohm that was measuring 66 ohms and R16 is a 1K that was measuring around 120 ohm. R16 didn't look as burned as R15, but it did break in half while extracting it! I suppose that's where the mysterious smoke was coming from. Also, none of the contact fingers on this unit are broken!!! One of them is a little bent, but it doesn't seem like it will affect the proper operation of things. I hear they're brittle, so I don't think I'm going to try to straighten it. I think it will be fine. The unit is ready to be installed back into the receiver, there's just one problem. I need to align the band change turret first. And I'm not really sure how I'm going to do that other than by eyeballing it. When I look at the pictures of the underside in the manual, I can see that they show the coil sections across from each other being roughly pointed sideways outward appearing almost perfectly horizontal. I figure I'll set the turret to lock in this position and then try to figure out a way to align it more finely when the RF section is reinstalled? I should've marked it, but of course I forgot. The easiest way of doing that is to remove one band of the RF modules, and I'd recommend the lowes't band. There are several caps that need replacing in those first 2 or 3 bands/sets of modules. Those spring clips can travel quite a distance, so make sure you have your finger firmly on each as you push their tabs out of the hole. 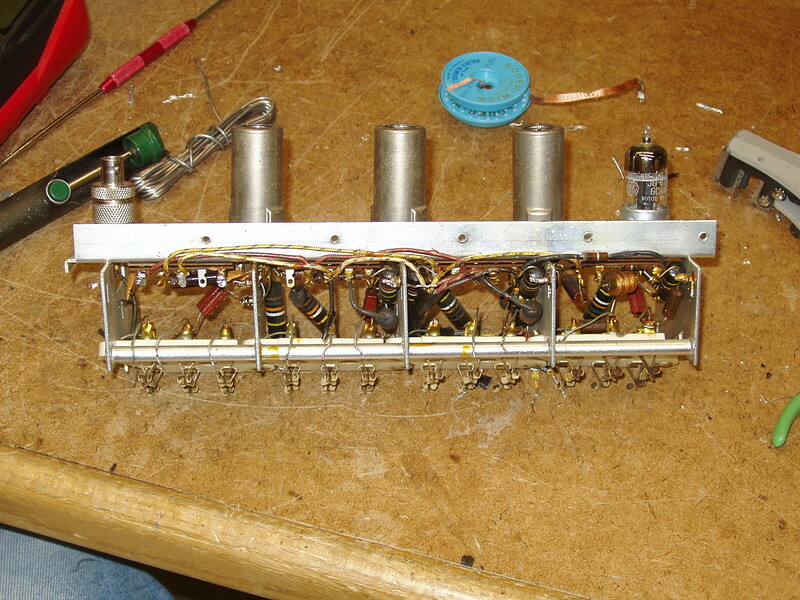 Removing the band modules makes replacing the RF deck a snap. Last edited by Mikeinkcmo on Nov Sun 05, 2017 8:14 pm, edited 1 time in total. The RF section is done!!! But I don't understand "THE RF section". This is one of six. You have five more to do. 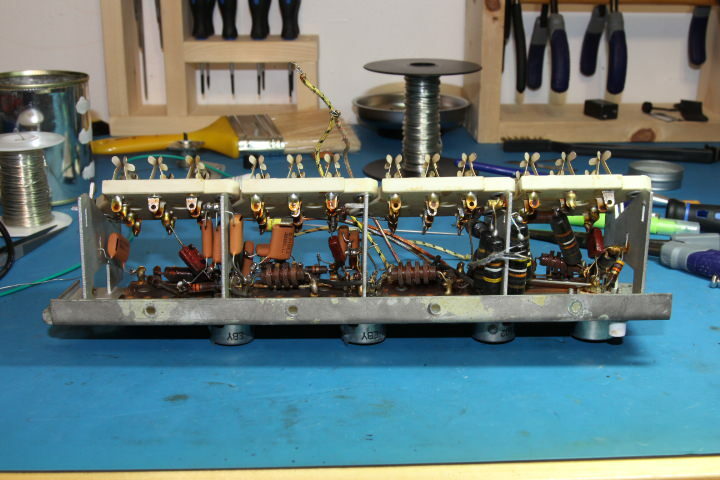 I'd call it the "RF Deck" in that it is the chassis for the RF amps, mixer and HF L.O.. 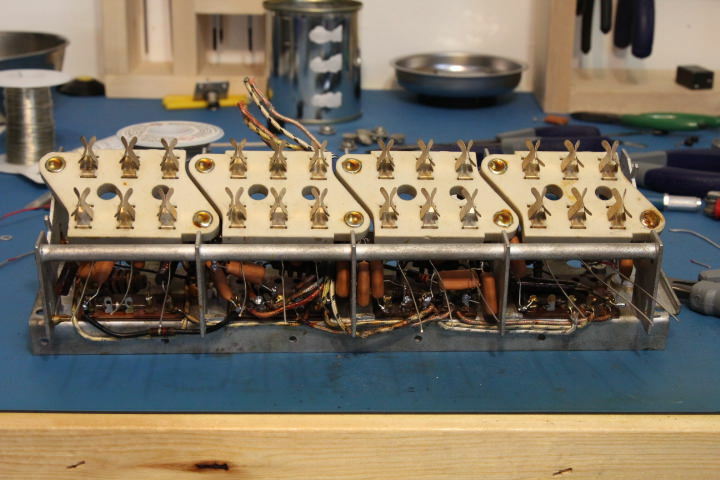 The 2 or 3 low band sets of modules are what he has left to do. DECK!!! That's the word I was looking for! Forgive my improper nomenclature. Yes, the RF deck is done. 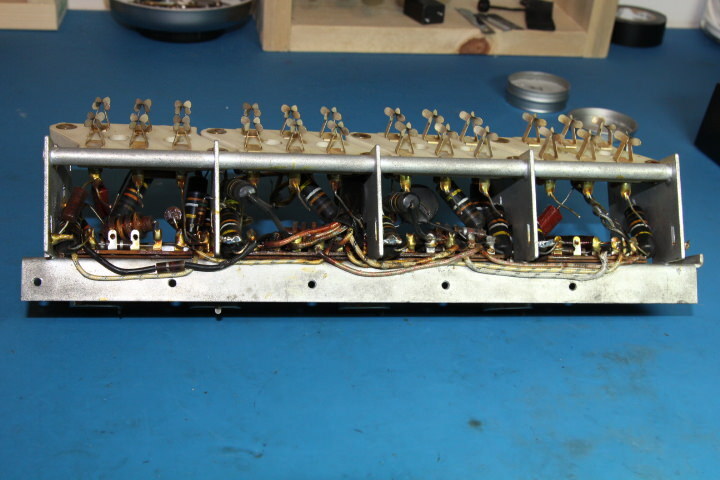 I have yet to do anything with the band coil sections other than removing a set to facilitate reinstalling the RF deck without having to worry about breaking the contact fingers. 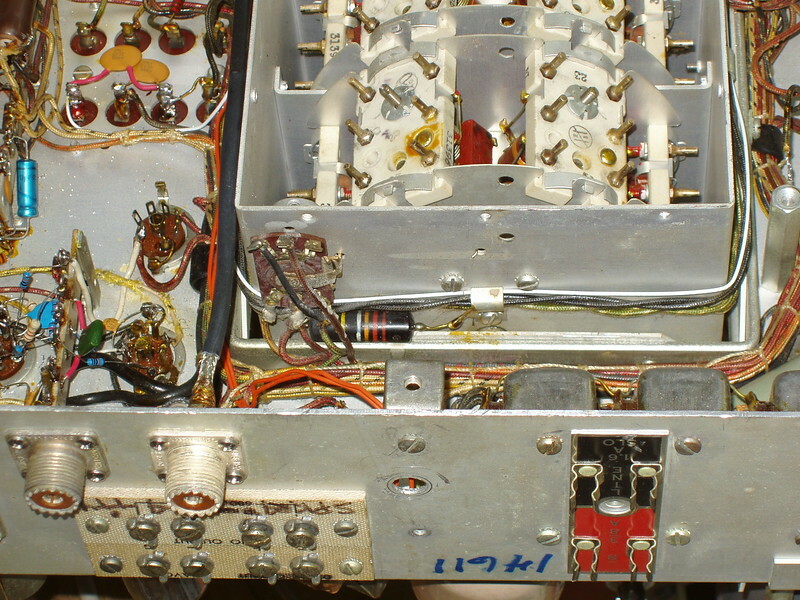 Now what I mean be aligning the turret is making sure that the band switch cam is set in the proper location as to "latch" when the band coil sections have their contacts properly meshed with the contact fingers on the RF deck. Since I had to remove the entire band change mechanism and I failed to mark the position of the turret when it was set in a band, no I can't be sure what position it should be in when set properly. I'm assuming that the contacts on the coil sections should be perpendicular to the diagonal edges on the baffles between sections in the band turret. Notice the 3 cover mounting screw holes along the top edge of the turret enclosure. Just below, and to the right of the center hole, there is a larger hole. if you look straight up from that hole you will notice corresponding holes in the turret discs holding the modules. All that lines up and you're turret detent is in the proper location. Simple. Before replacing the RF deck, be sure and check that the adjustment holes are clear for reaching down in to adjust the coils and trimmers. It is easy to block access and you don't want to have to remove the deck more than the 3 or 4 times required ( at least the one I did). I got pretty good at it. While the RF deck is out, you can also clean all the fingers with Deoxit. They get surprisingly grimy. 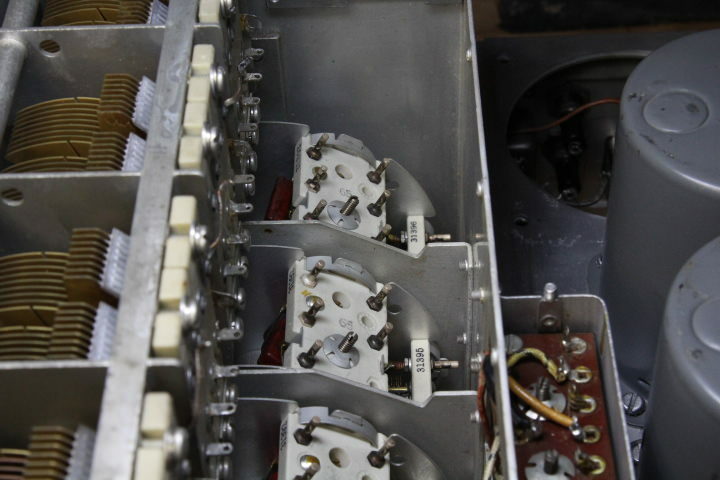 If they get dirty, you may have to wiggle the bandswitch to get them to make firm contact with the pins.